They are also called Pakhwaji, because of they play the timbrel. The word Mirasi comes from the Arabic word "miras" which means inheritance. Many sub groups exist among them. Mirasi people are a caste living in the northern parts of India. Some have migrated to nearby states. Mirasis in Uttar Pradesh live in regions such as Meerut. They live in most parts of Punjab state. Mirasi people entertain at fairs and sing at weddings. Many are laborers, and farming tenants, and also sell vegetables. The well-educated work in government, serve in the military and do research for genealogies. They have a caste council to judge in disputes and make sure that the people behave as they should. Mirasi people do not marry outside their group. They speak Magadhi, Urdu, Rajasthani, Punjabi, and Hindi. 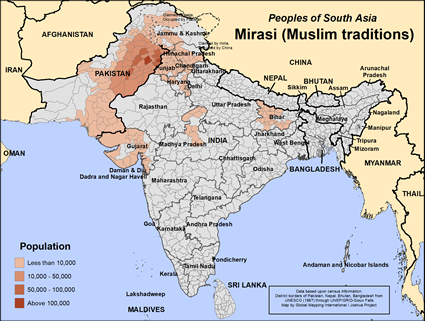 Mirasi people consist of Muslims, Hindus, Sikhs. 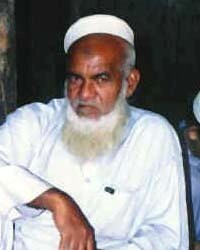 The Muslims among them believe the basic tenets of Islam, but their Islam is tainted with Hindu beliefs. One can only imagine the spiritual confusion involved with three major religions within their families and communities. Bible resources exist in Urdu and Hindi, but Mirasi people remain an unreached people group. * Pray that Mirasi Muslim people will be liberated by God's Holy Spirit from the many ties that bind them to lives devoid of Christ's blessings. * Pray that Mirasi Muslims will see past their respective traditional worship to the futility of it all and experience a growing desire to know and follow the one true God. * Pray for the Lord to multiply the reception and influence of His Word among Mirasi Muslims, leading them to love Him with their whole being. * Pray for the Holy Spirit to anoint Mirasi Muslim families, especially the children and youth, and to raise up a new generation of fruitful, multiplying witnesses of Christ's mercy and love. en.wikipedia.org/wiki/mirasiView Mirasi (Muslim traditions) in all countries.